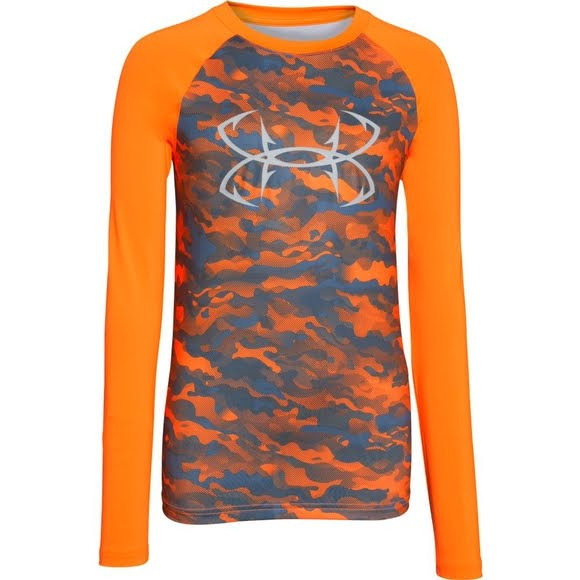 The Under Armour Boy's Youth CoolSwitch Thermocline Long Sleeve Shirt is loaded with features including CoolSwitch, Armourblock, and HeatGear technologies. The Under Armour Boy&apos;s Youth CoolSwitch Thermocline Long Sleeve Shirt is loaded with features including CoolSwitch, Armourblock, and HeatGear technologies. A raglan sleeve is a type of sleeve whose distinguishing characteristic is to extend in one piece fully to the collar, leaving a diagonal seam from underarm to collarbone. Commonly seen in non-formal fashion, it is popular in sports and exercise wear. ArmourBlock technology neutralizes the microbes that cause odor before there is any odor at all, resulting in maximum scent suppression.